Your Co-Payment is Due Desk Plate | 2" x 8"
Place this beautiful desk plate on your reception desk or check-in counter as a friendly reminder to your patients that their Insurance Co-Payment is Due at the time of service. Full Color Wave Shape Sign with Holder - 3.25" x 8"
This Desk Plate is a simple & classy solution to your signage situation when you need to remind your patients of your policies. 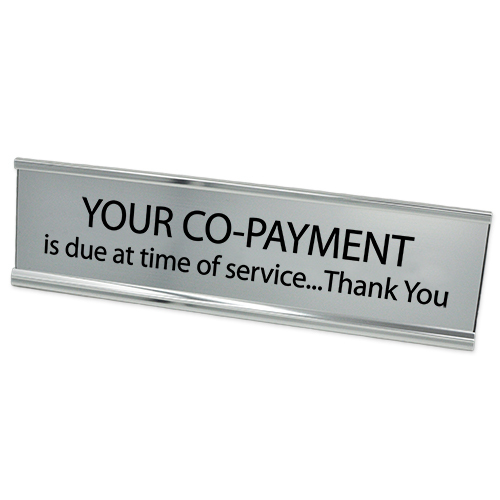 Let your patients know their Co-Payment is Due at time of service with this 2” x 8” desk plate. Plate is available in several engraving colors & 4 frame colors. Your Co-Payment Desk Plate is perfect for displaying on a receptionist desk or your sign-in counter. Order yours today. Most orders ship next business day!